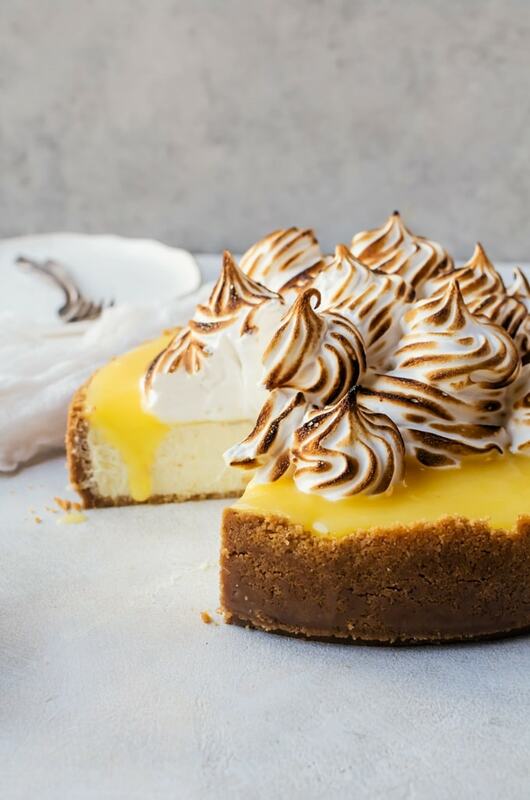 Tangy lemon curd and billowy meringue top a rich, lemony cheesecake for an unforgettable experience. 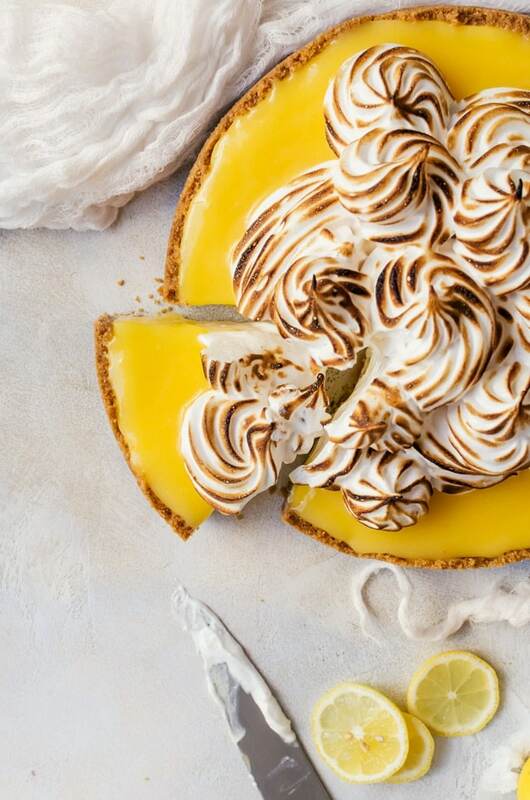 No one will be able to resist a lemon meringue cheesecake like this. 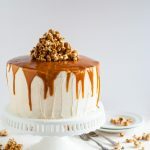 I’ve been dreaming of making this lemon meringue cheesecake for months. Months. I was inspired to make it when I saw some dreamy lemony something on a magazine cover while at a bookstore. I didn’t get a chance to see what it was exactly, but I was taken aback by how happy the bright yellow color made me. I decided to star concocting this dessert in my head right away. Lemon cheesecake was the very first cheesecake I ever made on my own. It was of course, in college. And my boyfriend at the time had never heard of a cheesecake that went in the oven because apparently they didn’t make them that way in England. He didn’t even consider what I made a true cheesecake. But it was good and lemony and we devoured it along with his flatmates. This time, I decide to up the lemon (and also not overbake it like I did back then) by adding extra lemon zest and a healthy dose of lemon curd right in the batter. To finish, I topped it with more lemon curd and all the meringue I could fit on it. I had an idea of how this lemon meringue cheesecake would taste, but the reality is so much better. The lemon is bright and tangy and sweet. It is like your tastebuds dance when you take a bite. And the billowy meringue is like a soft cloud that melts in your mouth. And who doesn’t love a graham cracker crust? It’s always the best part of a cheesecake. There is no way to resist. Make the recipe for lemon curd. This is best done the day before, or at least four hours ahead of time so it has time to chill. Preheat the oven to 325 degrees F. Cover the outside an 8" springform pan with aluminum foil. Add the graham cracker crumbs to a food processor. Run the food processor and drizzle in the melted butter. It should come together like wet sand. Add the graham cracker crumbs to the springform pan. Use the bottom and sides of a glass to press the crumbs to the bottom and sides of the pan. Make sure it is well packed together. Set aside in the refrigerator until needed. Add the cream cheese to a mixing bowl and beat with a paddle attachment until it is smooth and creamy. Scrape down the sides and bottom of the bowl as needed and as you add each next ingredient. Add the eggs in one at a time. Beat in each egg until adding another. Make sure each egg is completely combined with the cream cheese until you add in the next. Pour in the sugar, lemon zest, and vanilla and mix until the mixture is smooth again. Slowly add in the sour cream one cup at a time until it is thoroughly mixed in. Do not overmix. Fold in ½ cup of the lemon curd into the batter. You can either leave swirls of the curd in the batter or completely combine the curd into the batter. Pour the batter into the springform pan and bake for 45 minutes. The edges should look mostly set and the center will look jiggly still. Turn off the heat and keep the oven cracked with the cheesecake inside for an hour. This helps prevent cracking. Remove the cheesecake and allow to cool completely to room temperature. As the cheesecake is cooling, make the meringue. Clean a mixing bowl and whisk and thoroughly dry. Quickly rub down with lemon juice. Add the egg whites to the bowl and beat. While you are beating the whites, add the sugar and water to a small saucepan and heat without mixing until the sugar dissolves. 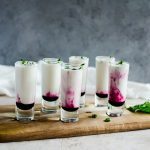 Add cream of tartar and salt to the egg whites and once the egg whites are at soft peaks, turn up the speed of your mixer and drizzle in the sugar syrup between the bowl and the whisk. Continue to beat until the whites form stiff, glossy peaks. Beat in the vanilla. Once the cheesecake is fully cooled (I chilled mine in the refrigerator for 30 minutes once it was cooled). Top with more lemon curd. Fit a piping bag with a large tip and fill with the meringue (or use a spoon) and top the cheesecake with the meringue. Lightly torch using a kitchen torch. Serve immediately. If you are not serving immediately, save the meringue until you are ready to serve. What are Graham’s crackers. Is it the same as cream crackers? Graham crackers are lightly sweetened crackers made with graham flour. Traditional uses in America are for s’mores, cheesecakes, and some pies. A good substitute would be vanilla wafer cookies or digestives.. 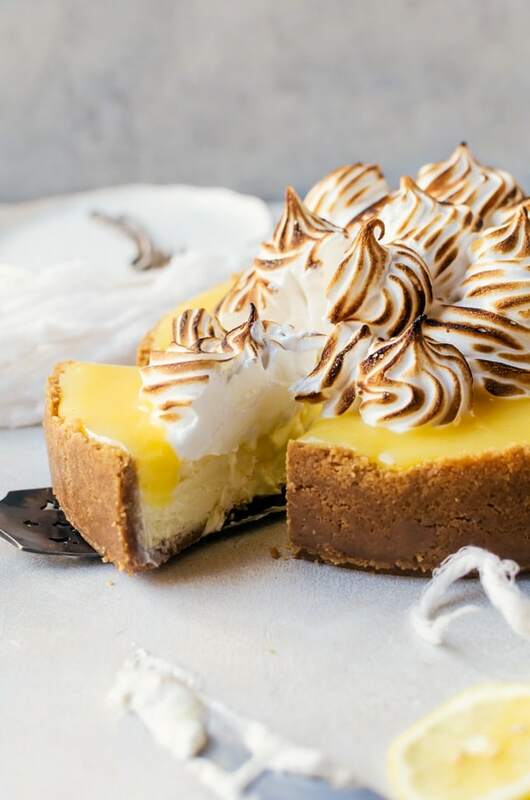 Lemon meringue pie merged with cheesecake…love it! 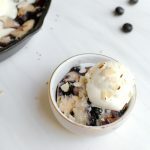 What a delicious combination of desserts into one ahhmazing super dessert! ha! 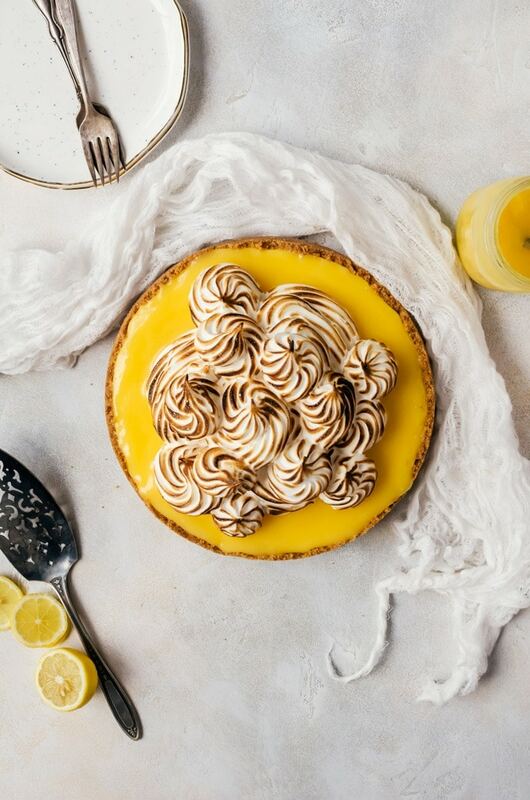 Seriously swooning over this lemon meringue cheesecake! I am a fra-reak for lemon curd and cheesecake, so the fact that you put lemon curd both in the cheesecake and on top? Well, you’ve just made me a ridiculously happy baker. Mission accomplished! I’m so glad you love lemon curd as much as I do!! I love the toasty meringue on top.